Baker’s ammonia works similarly in baked goods as baking soda or powder. It is a chemical leavening agent used in many traditional puff pastry and cookie recipes. Since its not used often, it can be difficult to find. Baker’s ammonia helps produce or stimulate production of carbon dioxide in baked goods to impart a light texture. It is also used as a pH control agent, to change or maintain active acidity or basicity. Baker’s ammonia was originally made by grounding up the horns of deer.2 Today, it is chemically obtained through reacting ammonia and carbon dioxide. 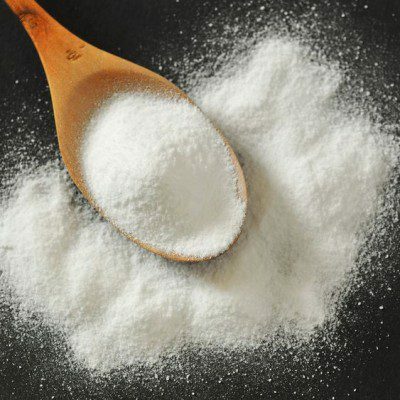 Nowadays, baking soda and baking powder have widely replaced the use of baker’s ammonia. However, the same crisp texture and light, fluffy composition cannot be achieved as well as from the utilization of baker’s ammonia. Many historic Greek, German, and Scandinavian recipes still call for baker’s ammonia. It is mostly used in cookies because it has a very strong odor. This way the odor bakes out when the cookies dries out in the oven.1 Some baker’s ammonia is used in cooking, while other uses expand as far as to include cough syrup, smokeless tobacco, smelling salts, and within emetics (medicine). Baker’s ammonia is made by bringing liquid ammonia into contact with carbon dioxide, yielding the chemical formula (NH4)2CO3. “What Is Baker’s Ammonia?” What Is Baker’s Ammonia? Cooks Illustrated, www.cooksillustrated.com/how_tos/6284-what-is-bakers-ammonia. Accessed 12 June 2017. “Ammonium Bicarbonate – Kitchen Dictionary.” Ammonium Bicarbonate – Kitchen Dictionary -Food.com, 17 Aug. 1999, www.food.com/about/ammonium-bicarbonate-780. Accessed 26 June 2017. “CFR – Code of Federal Regulations Title 21.” Accessdata.fda.gov, www.accessdata.fda.gov/scripts/cdrh/cfdocs/cfCFR/CFRSearch.cfm?fr=184.1137. Accessed 26 June 2017.